How many different tree types have you drawn? I actually thought I had drawn 3 different tree types but looking at the drawings again and my photos I think I have only drawn two, three if you count the strangler fig as a species iof tree. I thought that the trees in the study of a several trees exercise were a different species from the Banyan tree in the Larger Study of an Individual tree but looking at them now I think the tree in the latter is the same tree in the later stages of being strangled to death by the fig. What techniques did you use to distinguish each type? I’d say smoothing and hatching the first ‘Alien’ tree in the sketching individual tree exercise was very smooth like it was naked without bark. So smooth that you could see the stretch marks in the tree so for this tree I used very fine hatching, smoothing with my finger and erasing with the putty rubber. 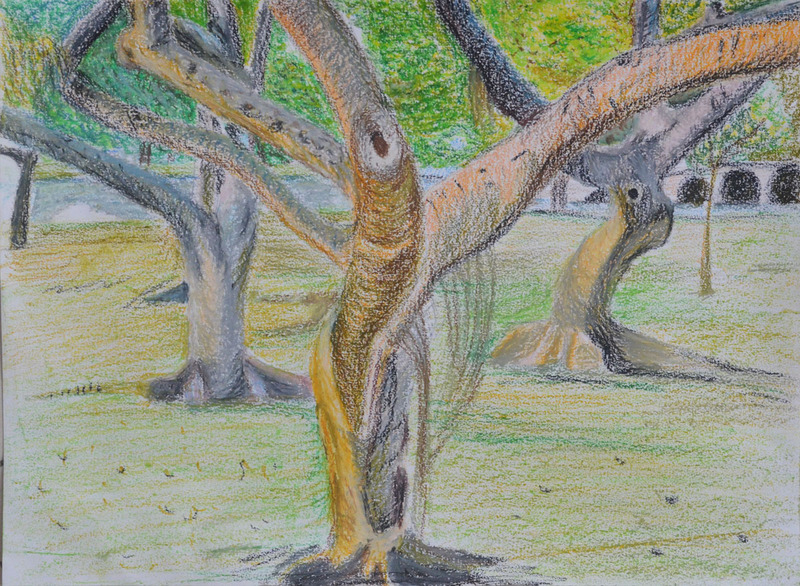 For the individual Banyan tree I used more hatching and did less smoothing but with the study of several trees it was all very rough hatching with oil pastels. What did you do to convey the mass of folioge? The banyan trees were pretty much borrowing most of their folioge but where their was some I used squiggling and the sketches of an individual tree I came to realise that the leaves were in groups of three and so I squiggled in a kind of upside down Adidas trifoil shape not that it is noticeable in the drawings. To convey depth I then shaded in under the squiggles with more pressure on the pencil. How did you handle light on the trees? Was it successful? For the first sketches the light was above the folioge and so I showed light and shadow on the tree by way of hatching and yes I think I was successful. 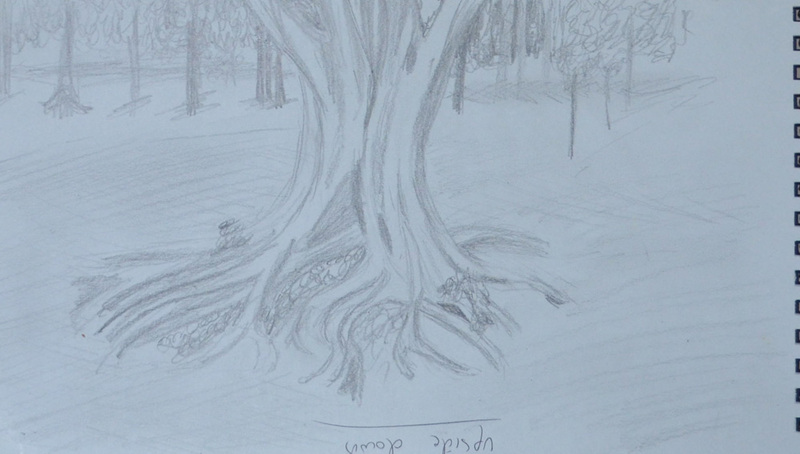 For the larger study of an individual tree the sun was behind the tree and so the whole of the tree was very dark but I depicted the light shining through the branches on the right by drawing the trees fainter than on the left. I don’t know how others will see it but it worked for me. I was going to use the putty rubber to show rays of light shining through but I sprayed it too soon. 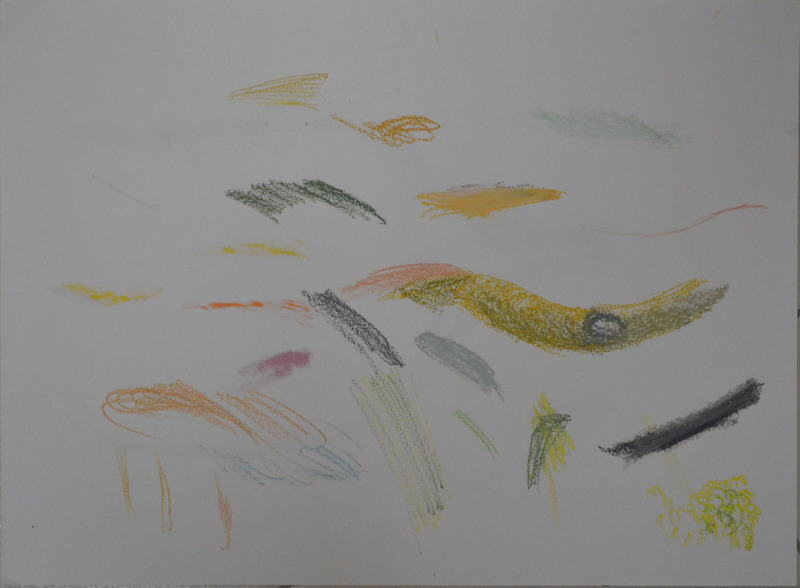 In the last exercise I used colour, it was early evening, and I think I managed to show this quite well in my drawing. Did you manage to select and simplify? How did you do this, and what could you do better? I did this differently in all three exercises. In the first exercise it was a case of not drawing to the top of the tree and only drawing what I felt was important, the roots, the trunk and the squiggled leaf shapes that framed the branches and trunk. 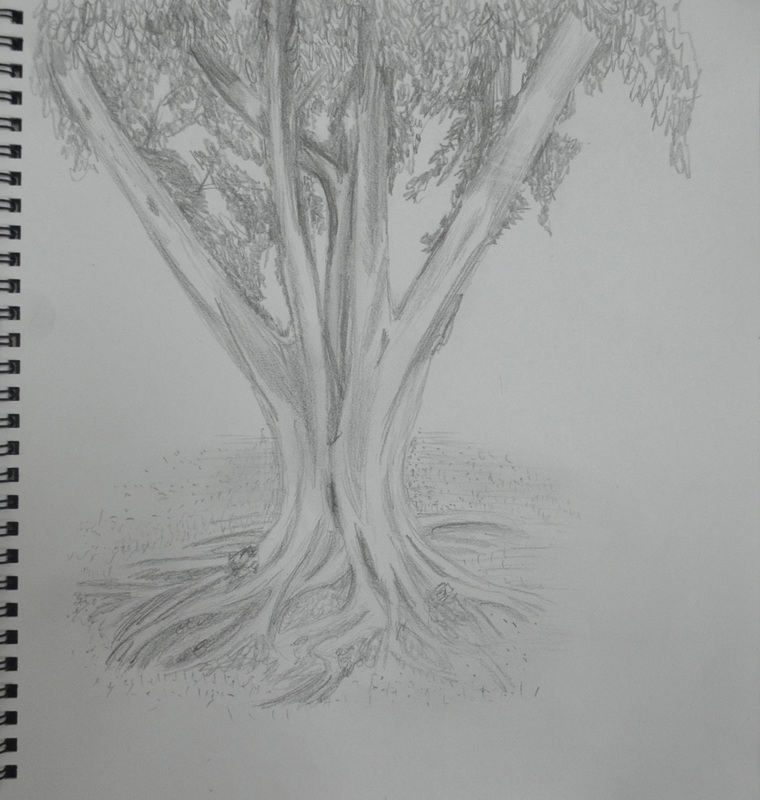 In the second exercise, I wasn’t too sure where branches and leaves were coming from and would have probably had to draw another 5 plants and bushes to get to the source, so I decided draw only what was within the branches of the Banyan tree. With the third drawing, a study of several trees I simplified by zooming in, I could probably do better next time by drawing more of the branches of the trees. 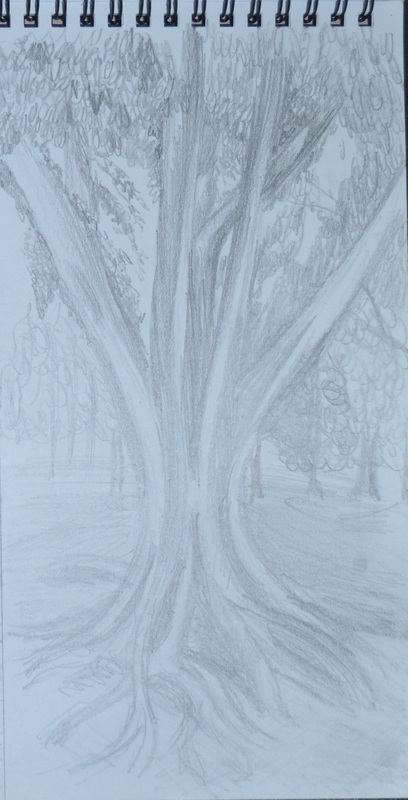 However, I am still pretty pleased with the close up of the trees in the finished drawing. While in the park browsing unique trees for the last two exercises I came across this group of trees and just had to take a photograph. I have no idea what kind of trees they are but they seem to be the same tree as the Banyan in the last exercise at the early stages of being latched on by the strangler fig, I don’t know why but they made me think of wailing banshees. Being in a great location with a European style bridge visible in the background and some nice reflections in the water behind them, I had no doubt at all that it would be these trees that I would be drawing for this exercise until it came down to choosing the medium. Given the trees surroundings oil pastels were ideal but on A3 quite clumsy and so I thought twice about them. I also thought twice about drawing these trees and started to look at other photos I had taken. In the end I did like the brief suggested and zoomed in on the three trees in the centre until I thought they were large enough to work on in oil pastel and give some texture through hatching rather than clumsily sketching from a distance. Being late with my third assignment I was dying to rush through this piece but I decided to take it steady and use a second sheet to get colours and blends right before committing to the final piece. There would have been nothing worse than getting half way through the drawing and messing up. I love the final drawing, which, because of the texture of the paper seems to be made up of little dots which reminds me of a George Seurat painting and has given me some ideas for my assignment piece. I have no idea what kind of tree I drew in the last exercise ‘Sketching an Individual Tree‘ but my subject for this exercise was very interesting. In the same ‘Trees in Literature’ section of the park was a Banyan tree, and this one was a wonderful example. The Banyan tree or ‘strangler fig’ is the national tree of India, it is pollinated by fig wasps and then the seeds are dispersed by fruit eating birds. If the seed is dropped on soil it is unlikely to survive but often the seeds are dropped on branches of other trees, where they germinate and send roots to the ground. The strangler fee often envelops part of the host tree and is also known to starve the host tree until it has rotted away inside. The tree in Chatuchak park had been well and truly taken over and it looked to me like the strangler fig was squeezing the host tree so tightly that the tree had been deformed by it’s grasp, with the branches of the host reaching out in every direction as though they were desperately reaching out for help. The sun was behind the tree facing me and so the tree was quite dark which was great because I got to use some wonderful tones and like the previous drawings of my alien tree in the last exercise the finished drawing came off looking quite ‘bio arty’. I started with a 6B pencil and then realised after about an inch of drawing, that the 6B pencil on the more toothy A3 sheet I was using, was far too smudgy and so quickly changed to a 4B pencil. I began by drawing the outlines of the branches in the top left hand corner of the paper and then drawing in the leaves with a squiggly line technique and from their I moved onto the texture of the branches and then did the same with the top right hand corner working my way down to the tree trunk. This was to make sure I didn’t smudge anything with the palm of my hand. Finally I worked my way to the roots of the tree through the tree trunk. With the sun being behind the tree I had to try and depict the sun shining through the tree branches and leaves in some way. I tried doing this by drawing the leaves more lightly on the right hand side. I was going to drag my putty rubber lightly over the top from the center of the leaves outwards in a star shape but then forgot and sprayed the drawing with hair lacquer too early. 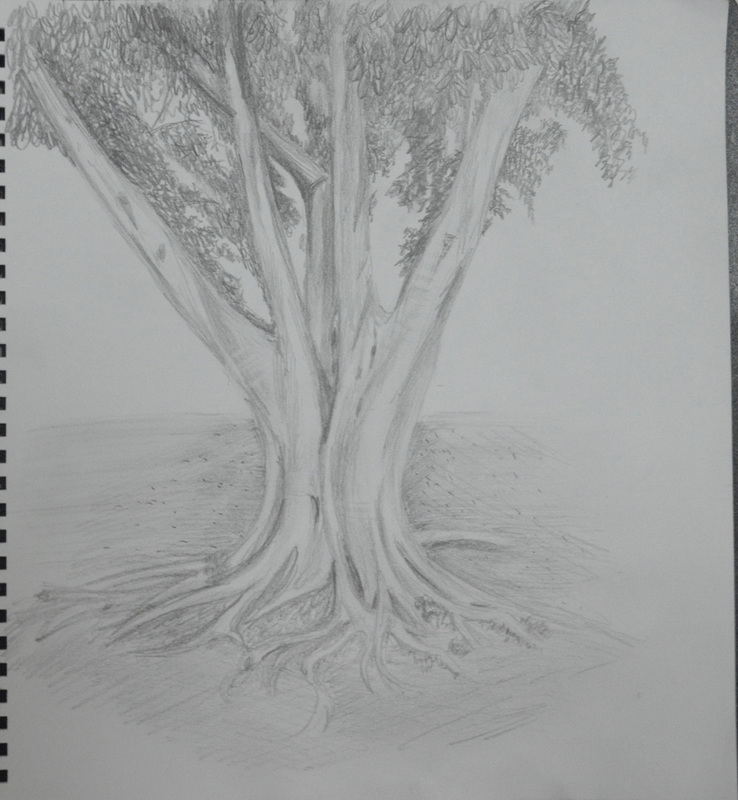 Most of the leaves that are in the drawing are not on the tree itself but rather on the trees around it with the host tree being practically bare but I wanted to use the branches of the Banyan tree to frame the life of the other trees above and behind it. 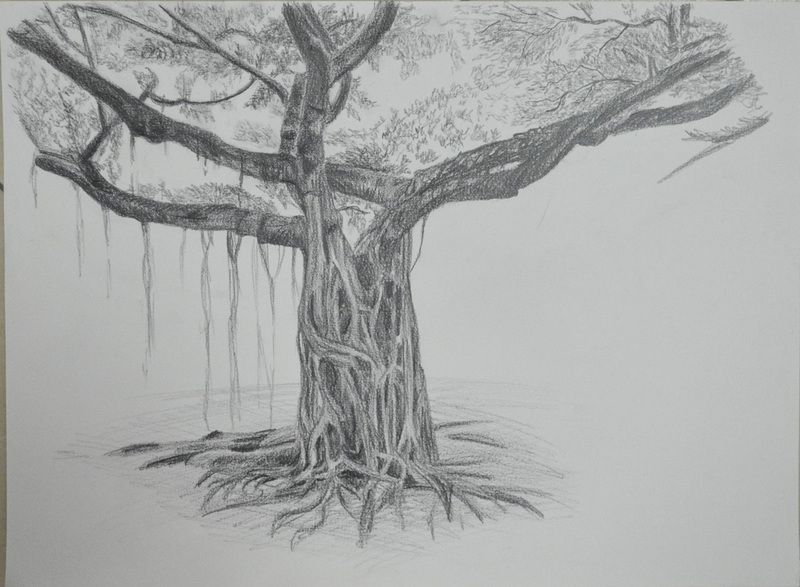 The reason why I did not do a full background to the drawing was that it would not have done the tree justice plus I wanted to make it look like the life within the branches was spilling over through the roots of the fig hanging off the branches. For this exercise I headed out to Suan Rot Fai Park again, railway park, where I did most of my work for Landscape Drawing. There was a eucalyptus tree there that really interested me due to it’s amazing rainbow colours. However, on the way there the traffic was so bad due to yellow shirt roadblocks in that area that we jumped out of the tuk tuk and decided to walk the rest of the way which was about a kilometre. To get to Suan Rot Fai we had to walk through another park, Chatuchak park which is just past the famous JJ weekend market and that was when the magic happened. There were hundreds of people in the park and most of those were yellow shirt protesters who were using Chatuchak park as a campsite and using the public toilets there as temporary showers. 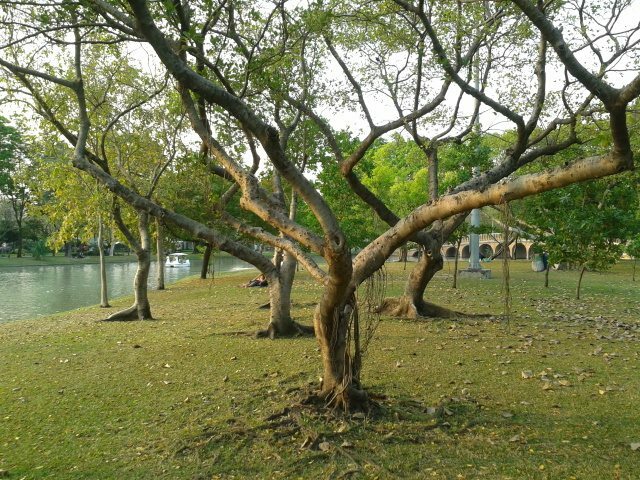 Anyway to get to Suan Rot Fai I had to walk around the whole inside of the park and in doing so I came across a section of the park called, trees in literature (translated from Thai), which was basically a collection of trees from fairy tale movies. The first tree that took my eye looked like two alien hands coming together and I just had to put pencil to paper. I split my sketchbook page in half and did two preliminary drawings at that size one of the trunk and one of the roots. Both drawings were in 6B but with the paper being almost toothless looked just the same as 3B or 4B, I thought it was the Mars Lumograph pencils that left less lead on the paper until the next exercise. The next drawing was on a full page of the whole tree, or most of the tree including roots, bark and foliage and like the brief said I built up on the two previous preliminary sketches and the tree was really starting to come alive, reminding me of a bio art tattoo especially the roots and where the twin trunks meet. I didn’t think I could improve on it but my next drawing proved me wrong. There were details the tree was missing, things that we see all the time in tree but never give a thought to, stretch marks! I only started to notice them on the last drawing so I managed to depict these stretch mark lines pointing a putty rubber and dragging it across the widest part of the trunk and branches. I have been drawing trees throughout this module or at least leaves and branches of them and there has been so much green that I haven’t enjoyed drawing them at all until now and I was really looking forward to the next having already chosen my next subject.